American manned lunar expedition. Begun in 1962; first landing on the moon 1969; sixth and final lunar landing 1972. The project that succeeded in putting a man on the moon. Apollo probably could have achieved its goal a little quicker by using a 2-man capsule for a direct flight. But all of the decisions made in the seven months after go-ahead proved basically correct. The Apollo program was not a hoax, but the real thing. The Apollo re-entry vehicle itself was originally initiated by NASA in 1960 as the next step beyond the primitive Mercury capsule. It was to be an all-purpose spacecraft for missions to earth orbit and the moon. At the time the design was defined, any moon landing was seen as a far-off unfounded objective - sometime in the 1970's. The capsule was to have a crew of three, because it was thought the crew would have to monitor the spacecraft's systems at all times - therefore, three 8-hour duty shifts. It had to be big enough inside to allow the 3-man crew to function for 14-day missions - the approximate length of the maximum envisioned autonomous earth orbit or lunar mission. These considerations set the size of the capsule, which NASA estimated would be under 4 metric tons. Max Faget, NASA Langley's "Chief Designer", had already settled on a preferred ballistic capsule configuration, essentially that used on Mercury, but with the slope of the sides increased to allow the capsule to achieve a lift to drag coefficient of 0.5 - necessary to limit G-forces to below 8 when re-entering from lunar distances. Other NASA centers and study contractors favored other shapes - lifting bodies, lenticular flying saucers, conical shapes based on the substantial experience in missile re-entry vehicles, General Electric's D-2 'headlight'. NASA funded extensive studies on all of these, but in the end it seemed that all of this work was undertaken just to prove that there was no alternative with significantly less weight than Faget's preferred design. After Yuri Gagarin's flight in April 1961, President Kennedy asked NASA to come up with a space first that could be achieved in a reasonable period of time - by the end of the decade - and definitively beat the Russians in the space race. A space station in earth orbit was rejected as being something that the Russians could too easily match. The same went for a manned circumlunar flight. The only mission that would require both sides to develop completely new launch vehicles and spacecraft was a manned lunar landing. Despite the tremendous cost - NASA management tripled the initial $8 billion estimate to be on the safe side - Kennedy announced this as a national goal in May 1961. The existing Apollo spacecraft concept could return a crew from the moon. But to get it there and back would require an immense booster. The traditional lunar profile was to launch a spacecraft toward the moon, have its landing stage brake it to a lunar landing, then have the ascent stage launch the re-entry capsule from the lunar surface back toward the earth. A spacecraft that could take an Apollo spacecraft on this profile, even using the high-energy but unflown propellant combination of liquid oxygen/liquid hydrogen, would have a total mass of 35 metric tons on trans-lunar injection. This would require a mass in low earth orbit of 90 metric tons. That in turn would require either two to three launches of a Saturn C-2 class booster, or a single launch of a Nova-class booster. Both would require new production and launch facilities, but only the Saturn C-3 could have the prototype 10-m-diameter first stages built under the personal supervision of von Braun's NASA Huntsville rocket team at the existing facility at Michoud. This had been the Peenemuende's rocket team method of working since V-2 days, and they were not going to allow the first stage to be built in any other way. But the payload requirements for direct-landing an Apollo on the moon were increasing rapidly during the course of 1961. The Apollo capsule began its inevitable weight growth. Its mass went to 4500 kg, then 5000 kg (and would reach 6000 kg by the time of the actual landings). NASA Langley also decided that only proven storable propellants could be used on the lunar landing and ascent stages. The payload requirement finally nearly doubled - 68 metric tons on trans-lunar injection and 181 metric tons in low earth orbit. The booster concept was increased in size by adding F-1 engines to the first stage and stretching the 10-m diameter stages. In the final concept two Saturn C-5 launches would be needed, and the spacecraft and trans-lunar injections stage would have to assembled or refueled in low earth orbit before proceeding toward the moon. This was known as the earth orbit rendezvous approach (EOR) and involved perfecting maneuvering, docking, and fuel transfer techniques that did not even exist yet. Back at NASA Langley, the idea arose that the mission could be achieved by using a method known as lunar orbit rendezvous. This had been suggested by the Chance Vought company in 1960. Langley's James Chamberlin proposed in July 1961 a moon-landing mission that would involve a single launch of a Saturn C-3, which would send a crew in a Gemini spacecraft to lunar orbit. Also aboard would be one or two lunar 'bugs' - little open-cockpit lunar landers. One crew member would spacewalk to the bug, strap himself into the seat, and then take it down to the lunar surface. After a brief surface mission, he would fly it back to lunar orbit. The Gemini pilot would rendezvous with the bug, the crewman would spacewalk back to the Gemini, and they would return to earth. This scenario was rejected by NASA Langley as too dangerous, too limited, and a threat to Faget's Apollo capsule project. But Langley did continue with the lunar orbit rendezvous scenario, but this time using the Apollo capsule together with a closed-cabin lunar excursion module (LM) lander that would take two crew to the surface. It was felt that this would allow two men to land on the moon in a single Saturn C-5 launch. The drawback was that all of the untried techniques of the earth orbit rendezvous method would have to be accomplished in lunar orbit, which seemed even less likely to succeed. NASA fostered a myth later of a lone crusading engineer, John Houboult, coming up with the "miracle concept" idea of LOR and fighting his way to the highest levels of NASA management to get it accepted. In fact it had been around for a long time, and made no sense at all. If the objective was to land two men on the moon, the same thing could be accomplished in a single Saturn C-5 launch on a direct flight using either a Gemini capsule or two-man Apollo-shaped capsule. LOR introduced development of an entirely new LM spacecraft, and the complexities of lunar orbit rendezvous and docking - all for the sake of retaining the Apollo capsule design. Use of either Gemini or a 2-man Apollo shape would allow the same mission to be accomplished with the same booster, and a lot more simply and probably earlier. By the end of 1961, all the major Apollo contracts had been issued, but the final configuration of the Saturn rocket and the method of achieving the lunar landing had still not been decided. Going to a new contractor for the Apollo capsule was not acceptable to NASA Administrator Webb or his sponsor, Vice President Johnson. North American had been selected at the presidential level in November 1961, overruling the selection of NASA's evaluation committee of Martin. The political and possibly corrupt factors that resulted in North American's selection were exposed after the Apollo 204 fire killed three astronauts six years later. But for whatever reasons, Webb and NASA Langley refused to abandon the 3-man North American Apollo design. Von Braun's team finally gave in to the inevitable, agreeing to LOR but with the proviso that a second Saturn C-5 send a direct lander 'logistics vehicle' to accompany the LM to the surface. This proviso was quickly forgotten. Jerome Wiesner, Kennedy's science adviser, fought to the bitter end for a 2-man capsule, single-launch, direct flight approach. But finally Webb got Kennedy to tell Wiesner to shut up, and despite detailed preliminary designs by McDonnell that proved that the 2-man direct approach was perfectly feasible, using many Gemini systems and components, the idea was shelved and Apollo went on its course. Grumman was selected to build the Lunar Module for the LOR approach in November 1962. The LM itself suffered horrendous weight growth as well, the initial 10 metric ton weight budget being exceeded by 50%. Luckily for NASA, von Braun's conservative Saturn design ended up delivering nearly 20% more payload than originally planned, and the growth in the Apollo capsule and LM could be accommodated. The assassination of Kennedy somehow made the commitment to the moon-landing goal inviolable, and two subsequent presidents saw it through to completion. But the project began receiving cutbacks as early as 1965. The costs of the Vietnam War and the missile race with the Soviet Union were contributing factors. But the major reason was a loss of public interest in manned spaceflight after the Russians fell behind in the space race. The Soviet Union had not taken the Apollo program seriously, believing it to be rhetoric. It took them three years to react, and they did not start their counterpart N1-L3 manned moon-landing program until the end of 1964. They attempted to beat Apollo with start three years late, with one tenth the budget, without a central management structure, and relying on a Soviet military for crucial support that was hostile to the program. Inevitably they did not succeed. Like Apollo, their L3 spacecraft grew in mass. Unlike Apollo, their N1 booster could not deliver the needed payload, and in any case never flew successfully. The N1-L3 program was cancelled in 1974, and the Soviet Union began a 15-year project to assimilate the management, reliability engineering, and quality assurance techniques that had made Apollo successful. Apollo was one of the great technical endeavors of the 20th Century. In the United States, it left remarkably little legacy. The spacecraft and launch vehicles developed at such enormous expense were abandoned and replaced by pursuit of a chimera - a fully reusable space shuttle. For the hundreds of thousands of industry and government workers that contributed to the project, it was one of the greatest periods of their lives. The generation that had learned how to get things done quickly in World War II were again called to action in the prime of their lives. Compare the schedule of Apollo - seven months from the decision to go ahead to issuance of all major contracts for the spacecraft, rocket stages, and launch site - to NASA's current performance. There were giants in those days - we shall not see their like again. Apollo SA-11 From September 1962 NASA planned to fly four early manned Apollo spacecraft on Saturn I boosters. Cancelled in October 1963 in order to fly all-up manned Apollo CSM on more powerful Saturn IB. Apollo SA-12 From September 1962 NASA planned to fly four early manned Apollo spacecraft on Saturn I boosters. Cancelled in October 1963 in order to fly all-up manned Apollo CSM on more powerful Saturn IB. Apollo SA-13 From September 1962 NASA planned to fly four early manned Apollo spacecraft on Saturn I boosters. Cancelled in October 1963 in order to fly all-up manned Apollo CSM on more powerful Saturn IB. Apollo SA-14 From September 1962 NASA planned to fly four early manned Apollo spacecraft on Saturn I boosters. Cancelled in October 1963 in order to fly all-up manned Apollo CSM on more powerful Saturn IB. Apollo 204 The planned first manned flight of the Apollo CSM, the Apollo C category mission. The crew was killed in a fire while testing their capsule on the pad on 27 January 1967, still weeks away from launch. Set back Apollo program by 18 months. Apollo 205 Planned second solo flight test of the Block I Apollo CSM on a Saturn IB. Cancelled after the Apollo 204 fire. Apollo 207 Planned Apollo D mission. Two Saturn IB launches would put Apollo CSM and LM into orbit. CSM crew would dock with LM, test it in earth orbit. Cancelled after Apollo 204 fire. Apollo 503 Cancelled Apollo E mission - test of the Apollo lunar module in high earth orbit. Lunar module was not ready. Instead mission flown only with CSM into lunar orbit as Apollo 8. Apollo 7 First manned test of the Apollo spacecraft. Although the systems worked well, the crew became grumpy with head colds and talked back to the ground. As a result, NASA management determined that none of them would fly again. Apollo 8 First manned flight to lunar orbit. Speed (10,807 m/s) and altitude (378,504 km) records. Mission resulted from audacious decision to send crew around moon to beat Soviets on only second manned Apollo CSM mission and third Saturn V launch. Apollo 9 First manned test of the Lunar Module. First test of the Apollo space suits. First manned flight of a spacecraft incapable of returning to earth. If rendezvous of the Lunar Module with the Apollo CSM had failed, crew would have been stranded in orbit. Apollo 10 Final dress rehearsal in lunar orbit for landing on moon. LM separated and descended to 10 km from surface of moon but did not land. Speed record (11,107 m/s). Apollo 11 First manned lunar landing. The end of the moon race and public support for large space programs. The many changes made after the Apollo 204 fire paid off; all went according to plan, virtually no problems. Apollo 12 Second manned lunar landing. Precision landing near Surveyor 3 that landed in 1967. Lightning struck the booster twice during ascent. Decision was made to press on to moon, despite possibility landing pyrotechnics damaged. 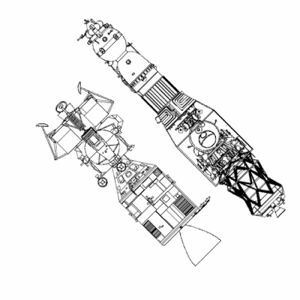 NASA's Lost Boilerplate - The Story of BP-1227 In 2002 the Encyclopedia Astronautica uncovered the forgotten story of the recovery of an Apollo capsule by the Soviet Union and it's return to the United States. The original March 2002 article provoked an early example of international group-research on the Internet, with a June 2002 update and with new information from the crewmembers of the USS Southwind in 2008. Now, 13 years later, Eddie Pugh's exhaustive research provides the definitive account of the event. Apollo 13 Fuel cell tank exploded en route to the moon, resulting in loss of all power and oxygen. Only through use of the still-attached LM as a lifeboat could the crew survive to return to earth. Altitude (401,056 km) record. Apollo: Soviets Recovered an Apollo Capsule! The truth only emerged 32 years later - the Soviets recovered an Apollo space capsule in 1970� the original article. Apollo 14 Third manned lunar landing. Only Mercury astronaut to reach moon. Five attempts to dock the command module with the lunar module failed for no apparent reason - mission saved when sixth was successful. Hike to Cone Crater frustrating; rim not reached. Apollo 15 First use of lunar rover on moon. Beautiful images of crew prospecting at edge of Hadley Rill. One of the three main parachutes failed, causing a hard but survivable splashdown. Apollo 16 Second Apollo mission with lunar rover. CSM main engine failure detected in lunar orbit. Landing almost aborted. Apollo 17 Final Apollo lunar landing mission. First geologist to walk on the moon. Apollo 18 Apollo 18 was originally planned in July 1969 to land in the moon's Schroter's Valley, a river-like channel-way. The original February 1972 landing date was extended when NASA cancelled the Apollo 20 mission in January 1970. Apollo 18 in turn cancelled on 2 September 1970 because of congressional cuts in FY 1971 NASA appropriations. Apollo 19 Apollo 19 was originally planned to land in the Hyginus Rille region, which would allow study of lunar linear rilles and craters. Apollo 19 in turn cancelled on 2 September 1970 because of congressional cuts in FY 1971 NASA appropriations. Apollo 20 Apollo 20 was originally planned in July 1969 to land in Crater Copernicus, a spectacular large crater impact area. Later Copernicus was assigned to Apollo 19, and the preferred landing site for Apollo 20 was the Marius Hills, or, if the operational constraints were relaxed, the bright crater Tycho. The planned December 1972 flight was cancelled on January 4, 1970, before any crew assignments were made. Apollo The successful US project to land a man on the moon. Soviets Recovered an Apollo Capsule! - 2008 version In 2002 this web site broke the story that the Soviet Union had recovered an Apollo capsule in 1969 and returned it to the Americans a year later in the extraordinary Cold War visit to Murmansk by the American Coast Guard icebreaker Southwind. Recently Michael Stronski, a Southwind crew member, has provided additional extraordinary photographs of the event. Family: Lunar Bases. Country: USA. Spacecraft: Apollo LM, Apollo CSM. Launch Vehicles: Saturn C-2, Saturn C-8, Saturn I, Saturn IB, Saturn V. Launch Sites: Cape Canaveral. Bibliography: 16, 18, 2292, 2293, 2294, 2298, 2311, 2314, 2315, 2316, 2317, 2318, 2319, 2320, 2321, 2322, 2324, 2325, 2328, 2329, 2332, 2335, 2340, 2345, 2348, 2352, 2356, 2358, 2363, 2365, 26, 27, 33, 4401, 4408, 4409, 4410, 60. Chance Vought study of the lunar orbit rendezvous method - . Nation: USA. Program: Apollo. Spacecraft: Apollo LM, Apollo Lunar Landing, LM Mode Debate, LM Source Selection. Thomas E. Dolan of the Chance Vought Corporation prepared a company-funded design study of the lunar orbit rendezvous method for accomplishing the lunar landing mission..
1960 September 13 - . LV Family: Saturn I. Launch Vehicle: Saturn C-2. Apollo Study Bidder's Conference - . Nation: USA. Program: Apollo. Class: Moon. Type: Manned lunar spacecraft. 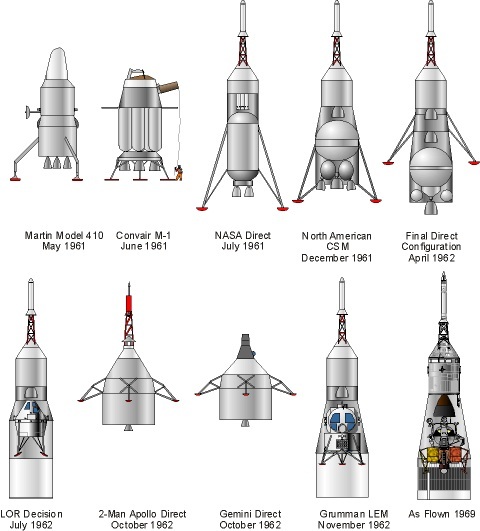 Spacecraft: Apollo CSM, Apollo Lunar Landing, CSM ECS, CSM Source Selection. Bidder's conference for circumlunar Apollo. Specification: Saturn C-2 compatability (6,800 kg mass for circumlunar mission); 14 day flight time; three-man crew in shirt-sleeve environment..
Low Committee established - . Nation: USA. Program: Apollo. Spacecraft: Apollo CSM, Apollo Lunar Landing, CSM Source Selection, LM Mode Debate, LM Source Selection. The Manned Lunar Landing Task Group (Low Committee) set up by the Space Exploration Program Council was instructed to prepare a position paper for the NASA Fiscal Year 1962 budget presentation to Congress. The paper was to be a concise statement of NASA's lunar program for Fiscal Year 1962 and was to present the lunar mission in term of both direct ascent and rendezvous. The rendezvous program would be designed to develop a manned spacecraft capability in near space, regardless of whether such a technique would be needed for manned lunar landing. In addition to answering such questions as the reason for not eliminating one of the two mission approaches, the Group was to estimate the cost of the lunar mission and the date of its accomplishment, though not in specific terms. Although the decision to land a man on the moon had not been approved, it was to be stressed that the development of the scientific and technical capability for a manned lunar landing was a prime NASA goal, though not the only one. The first meeting of the Group was to be held on January 9. 1961 January 9 - . LV Family: Nova. Launch Vehicle: Nova 4L. First meeting of the Manned Lunar Landing Task Group - . Nation: USA. Related Persons: Silverstein. Program: Apollo. Spacecraft: Apollo CSM, Apollo Lunar Landing, CSM Source Selection, LM Mode Debate, LM Source Selection. the development of technology to permit exploitation of space flight for scientific, military, and commercial uses. To accomplish the first step, a great increase in launch vehicle capability would be needed beyond that provided by current funding. A comparison of a three-million-pound-thrust and a six-million-pound-thrust Nova launch vehicle was made. It was estimated that a 60,000- to 80,000-pound payload to escape velocity would be needed for a manned lunar landing mission. 1961 February 7 - . LV Family: Saturn I. Launch Vehicle: Saturn C-2. Final report of the Low Committee - . Nation: USA. Related Persons: Seamans. Program: Apollo. Spacecraft: Apollo Lunar Landing. The Manned Lunar Landing Task Group (Low Committee) transmitted its final report to NASA Associate Administrator Robert C. Seamans, Jr. The Group found that the manned lunar landing mission could be accomplished during the decade, using either the earth orbit rendezvous or direct ascent technique. Multiple launchings of Saturn C-2 launch vehicles would be necessary in the earth orbital mode, while the direct ascent technique would require the development of a Nova-class vehicle. Information to be obtained through supporting unmanned lunar exploration programs, such as Ranger and Surveyor, was felt to be essential in carrying out the manned lunar mission. Total funding for the program was estimated at just under $7 billion through Fiscal Year 1968. Apollo Congressional hearings. - . Nation: USA. Related Persons: Seamans. Program: Apollo. Spacecraft: Apollo Lunar Landing. In response to questioning by the House Science and Astronautics Committee, Associate NASA Administrator Seamans repeated the general estimate of $20 to $40 billion as the cost for the total effort required to achieve a lunar landing, that an all-out program might cost more, and that 1967 could be considered only as a possible planning date at this stage of such a complex task. 1961 May 25 - . Kennedy Proclaims Moon Landing Objective - . Nation: USA. Related Persons: Kennedy. Program: Apollo. Spacecraft: Apollo Lunar Landing. Following Gagarin's flight and Bay of Pigs failure, Kennedy announces the objective of landing an American on the moon by end of the decade. In his second State of the Union Message President Kennedy said: "With the advice of the Vice President, who is Chairman of the National Space Council, we have examined where we (United States) are strong and where we are not, where we may succeed and where we may not. . . . Now is the time to take longer strides-time for a great new American enterprise-time for this Nation to take a clearly leading role in space achievement which in many ways may hold the key to our future on Earth." President Kennedy set forth an accelerated space program based upon the long-range national goals of landing a man on the Moon and returning him safely to Earth; early development of the Rover nuclear rocket; speed up the use of Earth satellites for worldwide communications; and provide "at the earliest possible time a satellite system for worldwide weather observation." An additional $549 million was requested for NASA over the new administration March budget requests; $62 million was requested for DOD for starting development of a solid-propellant booster of the Nova class. 1961 June 10 - . LV Family: Saturn I. Launch Vehicle: Saturn C-2. Lundin Committee recommended earth orbit rendezvous mode - . Nation: USA. Related Persons: Seamans. Program: Apollo. Spacecraft: Apollo Lunar Landing. 'The Lundin Committee completed its study of various vehicle systems for the manned lunar landing mission, as requested on May 25 by NASA associate Administrator Robert C. Seamans, Jr. The Committee had considered alternative methods of rendezvous: earth orbit, lunar orbit, a combination of earth and lunar orbit, and lunar surface. Launch vehicles studied were the Saturn C-2 and C-3. Conclusion was that 43,000 kg stage (85% fuel) was needed for a lunar landing mission. The concept of a low- altitude earth orbit rendezvous using two or three C-3's was clearly preferred by the Committee. Reasons for this preference were the small number of launches and orbital operations required and the fact that the Saturn C- 3 was considered to be an efficient launch vehicle of great utility and future growth. 1961 August 14-15 - . Apollo pre-proposal bidders' briefing - . Nation: USA. Program: Apollo. Spacecraft: Apollo CSM, Apollo Lunar Landing, CSM Source Selection. STG held a pre-proposal briefing at Langley Field, Va., to answer bidders' questions pertaining to the Request for Proposal for the development of the Apollo spacecraft. 14 companies (Boeing, Vought, Douglas, GD, Goodyear, Grumman, Lockheed, Martin, McDonnell, Radio Corp, Republic, STL) attended. The winning bidder would receive contract for CSM (but not LM, if any) and integrate spacecraft with launch vehicle. 1961 August 24 - . Launch Site: Cape Canaveral. Launch Complex: Cape Canaveral. Merritt Island selected for Saturn V launch site. - . Nation: USA. Program: Apollo. Spacecraft: Apollo Lunar Landing. Heaton Committee recommends earth orbit rendezvous for Apollo mission - . Nation: USA. Program: Apollo. Spacecraft: Apollo Lunar Landing. The Ad Hoc Task Group for Study of Manned Lunar Landing by Rendezvous Techniques, Donald H. Heaton, Chairman, reported its conclusions: rendezvous offered the earliest possibility for a successful lunar landing, the proposed Saturn C-4 configuration should offer a higher probability of an earlier successful manned lunar landing than the C-3, the rendezvous technique recommended involved rendezvous and docking in earth orbit of a propulsion unit and a manned spacecraft, the cost of the total program through first lunar landing by rendezvous was significantly less than by direct ascent. 1961 September 26 - . Launch Vehicle: Saturn V.
Bidders conference for S-IC stage. - . Nation: USA. Program: Apollo. Spacecraft: Apollo Lunar Landing. NASA bidders conference on a contract to produce the booster (S-I) stage of the Saturn vehicle was held at the Municipal Auditorium, New Orleans..
1962 January 5 - . Launch Vehicle: Saturn V.
Three-man Apollo spacecraft, Saturn C-5 launch vehicle announced - . Nation: USA. Program: Apollo. Spacecraft: Apollo Lunar Landing. NASA made public the drawings of the three-man Apollo spacecraft to be used in the lunar landing development program, On January 9, NASA announced its decision that the Saturn C-5 would be the lunar launch vehicle..
1962 April 1-7 - . Design criteria of the Apollo service module for the lunar landing maneuver - . Nation: USA. Program: Apollo. Spacecraft: Apollo CSM, Apollo Lunar Landing. NAA was directed by the MSC Apollo Spacecraft Project Office to begin a study to define the configuration and design criteria of the service module which would make the lunar landing maneuver and touchdown..
1962 April 2-3 - . Launch Vehicle: Saturn V.
Meeting at NASA Headquarters reviews the lunar orbit rendezvous (LOR) technique for Project Apollo - . Nation: USA. Related Persons: Geissler, Horn, Maynard, Shea. Program: Apollo. Spacecraft: Apollo CSM, Apollo Lunar Landing, CSM LES, CSM Recovery, CSM SPS, CSM Television. A meeting to review the lunar orbit rendezvous (LOR) technique as a possible mission mode for Project Apollo was held at NASA Headquarters. Representatives from various NASA offices attended: Joseph F. Shea, Eldon W. Hall, William A. Lee, Douglas R. Lord, James E. O'Neill, James Turnock, Richard J. Hayes, Richard C. Henry, and Melvyn Savage of NASA Headquarters; Friedrich O. Vonbun of Goddard Space Flight Center (GSFC); Harris M. Schurmeier of Jet Propulsion Laboratory; Arthur V. Zimmeman of Lewis Research Center; Jack Funk, Charles W. Mathews, Owen E. Maynard, and William F. Rector of MSC; Paul J. DeFries, Ernst D. Geissler, and Helmut J. Horn of Marshall Space Flight Center (MSFC); Clinton E. Brown, John C. Houbolt, and William H. Michael, Jr., of Langley Research Center; and Merrill H. Mead of Ames Research Center. Each phase of the LOR mission was discussed separately. The launch vehicle required was a single Saturn C-5, consisting of the S-IC, S-II, and S-IVB stages. To provide a maximum launch window, a low earth parking orbit was recommended. For greater reliability, the two-stage-to-orbit technique was recommended rather than requiring reignition of the S-IVB to escape from parking orbit. The current concepts of the Apollo command and service modules would not be altered. The lunar excursion vehicle (LEV), under intensive study in 1961, would be aft of the service module and in front of the S-IVB stage. For crew safety, an escape tower would be used during launch. Access to the LEV would be provided while the entire vehicle was on the launch pad. Both Apollo and Saturn guidance and control systems would be operating during the launch phase. The Saturn guidance and control system in the S-IVB would be "primary" for injection into the earth parking orbit and from earth orbit to escape. Provisions for takeover of the Saturn guidance and control system should be provided in the command module. Ground tracking was necessary during launch and establishment of the parking orbit, MSFC and GSFC would study the altitude and type of low earth orbit. The LEV would be moved in front of the command module "early" in the translunar trajectory. After the S-IVB was staged off the spacecraft following injection into the translunar trajectory, the service module would be used for midcourse corrections. Current plans were for five such corrections. If possible, a symmetric configuration along the vertical center line of the vehicle would be considered for the LEV. Ingress to the LEV from the command module should be possible during the translunar phase. The LEV would have a pressurized cabin capability during the translunar phase. A "hard dock" mechanism was considered, possibly using the support structure needed for the launch escape tower. The mechanism for relocation of the LEV to the top of the command module required further study. Two possibilities were discussed: mechanical linkage and rotating the command module by use of the attitude control system. The S-IVB could be used to stabilize the LEV during this maneuver. The service module propulsion would be used to decelerate the spacecraft into a lunar orbit. Selection of the altitude and type of lunar orbit needed more study, although a 100-nautical-mile orbit seemed desirable for abort considerations. The LEV would have a "point" landing (±½ mile) capability. The landing site, selected before liftoff, would previously have been examined by unmanned instrumented spacecraft. It was agreed that the LEV would have redundant guidance and control capability for each phase of the lunar maneuvers. Two types of LEV guidance and control systems were recommended for further analysis. These were an automatic system employing an inertial platform plus radio aids and a manually controlled system which could be used if the automatic system failed or as a primary system. The service module would provide the prime propulsion for establishing the entire spacecraft in lunar orbit and for escape from the lunar orbit to earth trajectory. The LEV propulsion system was discussed and the general consensus was that this area would require further study. It was agreed that the propulsion system should have a hover capability near the lunar surface but that this requirement also needed more study. It was recommended that two men be in the LEV, which would descend to the lunar surface, and that both men should be able to leave the LEV at the same time. It was agreed that the LEV should have a pressurized cabin which would have the capability for one week's operation, even though a normal LOR mission would be 24 hours. The question of lunar stay time was discussed and it was agreed that Langley should continue to analyze the situation. Requirements for sterilization procedures were discussed and referred for further study. The time for lunar landing was not resolved. In the discussion of rendezvous requirements, it was agreed that two systems be studied, one automatic and one providing for a degree of manual capability. A line of sight between the LEV and the orbiting spacecraft should exist before lunar takeoff. A question about hard-docking or soft-docking technique brought up the possibility of keeping the LEV attached to the spacecraft during the transearth phase. This procedure would provide some command module subsystem redundancy. Direct link communications from earth to the LEV and from earth to the spacecraft, except when it was in the shadow of the moon, was recommended. Voice communications should be provided from the earth to the lunar surface and the possibility of television coverage would be considered. A number of problems associated with the proposed mission plan were outlined for NASA Center investigation. Work on most of the problems was already under way and the needed information was expected to be compiled in about one month. (This meeting, like the one held February 13-15, was part of a continuing effort to select the lunar mission mode). 1962 April 24 - . Launch Vehicle: Saturn V.
Rosen recommends Saturn C-5 design and lunar orbit rendezvous - . Nation: USA. Related Persons: Rosen, Milton. Program: Apollo. Spacecraft: Apollo LM, Apollo Lunar Landing, CSM Recovery, LM Mode Debate, LM Source Selection. Milton W. Rosen, NASA Office of Manned Space Flight Director of Launch Vehicles and Propulsion, recommended that the S-IVB stage be designed specifically as the third stage of the Saturn C-5 and that the C-5 be designed specifically for the manned lunar landing using the lunar orbit rendezvous technique. The S-IVB stage would inject the spacecraft into a parking orbit and would be restarted in space to place the lunar mission payload into a translunar trajectory. Rosen also recommended that the S- IVB stage be used as a flight test vehicle to exercise the command module (CM), service module (SM), and lunar excursion module (LEM) (previously referred to as the lunar excursion vehicle (LEV)) in earth orbit missions. The Saturn C-1 vehicle, in combination with the CM, SM, LEM, and S-IVB stage, would be used on the most realistic mission simulation possible. This combination would also permit the most nearly complete operational mating of the CM, SM, LEM, and S-IVB prior to actual mission flight. 1962 April 24 - . Indecision on the lunar mission mode causing delays in Apollo program - . Nation: USA. Program: Apollo. Spacecraft: Apollo LM, Apollo Lunar Landing, LM Mode Debate, LM Source Selection. MSC Associate Director Walter C. William reported to the Manned Space Flight Management Council that the lack of a decision on the lunar mission mode was causing delays in various areas of the Apollo spacecraft program, especially the requirements for the portions of the spacecraft being furnished by NAA. 1962 May 25 - . LV Family: Nova. Launch Vehicle: Saturn C-8. Apollo lunar landing mode component schedules and cost breakdowns prepared - . Nation: USA. Related Persons: Holmes, Brainard. Program: Apollo. Spacecraft: Apollo Lunar Landing. D. Brainerd Holmes, NASA's Director of Manned Space Flight, requested the Directors of Launch Operations Center, Manned Spacecraft Center, and Marshall Space Flight Center (MSFC) to prepare supporting component schedules and cost breakdowns through Fiscal Year 1967 for each of the proposed lunar landing modes: earth orbit rendezvous, lunar orbit rendezvous, and direct ascent. For direct ascent, a Saturn C-8 launch vehicle was planned, using a configuration of eight F-1 engines, eight J-2 engines, and one J-2 engine. MSFC was also requested to submit a proposed schedule and summary of costs for the Nova launch vehicle, using the configuration of eight F-1 engines, two M-1 engines, and one J-2 engine. Each Center was asked to make an evaluation of the schedules as to possibilities of achievement, major problem areas, and recommendations for deviations. 1962 July 11 - . Selection of LOR as Apollo Mission Mode - . Nation: USA. Program: Apollo. Class: Manned. Type: Manned space station. Spacecraft: Apollo Lunar Landing. 1962 July 25 - . Invitation to bid for the Apollo lunar excursion module - . Nation: USA. Program: Apollo. Spacecraft: Apollo LM, Apollo Lunar Landing, LM Original Specification, LM Source Selection. 1963 December 31 - . LV Family: Minuteman. Phillips appointed Deputy Director of the Apollo Program - . Spacecraft Bus: Apollo Lunar Landing. Spacecraft: Apollo. Brigadier General Samuel C. Phillips, Vice Commander, Ballistic Systems Division, and former Minuteman program director, was appointed Deputy Director of the Apollo Manned Lunar Landing Program (NASA). 1965 January 21-28 - . STL sole contractor for the Apollo LEM descent engine - . Nation: USA. Program: Apollo. Spacecraft: Apollo LM, Apollo Lunar Landing, LM Descent Propulsion. Parallel development of the LEM descent engine was halted. Space Technology Laboratories was named the sole contractor; the Rocketdyne contract was canceled. Grumman estimated that the cost of Rocketdyne's program would be about $25 million at termination. 1966 May 11 - . Plans for Apollo space rescue discontinued - . Nation: USA. Related Persons: Faget, Low, George. Program: Apollo. Spacecraft: Apollo Lunar Landing, Gemini Lunar Surface Rescue Spacecraft. MSC Deputy Director George M. Low recommended to Maxime A. Faget, MSC, that, in light of Air Force and Aerospace Corp. studies on space rescue, MSC plans for a general study on space rescue be discontinued and a formal request be made to OMSF to cancel the request for proposals, which had not yet been released. As an alternative, Low suggested that MSC should cooperate with the Air Force to maximize gains from the USAF task on space rescue requirements. 1967 August 11 - . Launch Vehicle: Saturn V.
Review of the content of the Apollo program to determine alternatives for budget decisions - . Nation: USA. Program: Apollo. Spacecraft: Apollo Lunar Landing. Apollo Program Director Samuel C. Phillips was appointed Chairman of a NASA task group, reporting to Administrator James E. Webb, Deputy Administrator Robert C. Seamans, Jr., and Associate Administrator for Manned Space Flight George E. Mueller. The group was chartered to review the content of the Apollo program in order to determine alternatives necessary for programming and budget planning decisions. It would inquire into and report on all aspects of the Apollo program necessary to provide a base of accurate data and information to support decisions on FY 1968 expenditure control and FY 1969 budget planning. Specifically, the group was requested to identify planned activities that could be eliminated if the Apollo program were to be terminated with the manned lunar landing. The group was also requested to determine the effect of placing a hold order on production of Saturn V vehicles 512 through 515 and to develop the cost estimates resulting from these actions as well as other tangible alternatives. 1968 February 19 - . OMSF to issue a definition for the end of the Apollo program - . Nation: USA. Program: Apollo. Spacecraft: Apollo ALSEP, Apollo Lunar Landing. MSC Deputy Director George S. Trimble, Jr., recommended to Apollo Program Director Phillips that OMSF issue a definition for the end of the Apollo program. Trimble pointed out that parts of MSC planning would be clearer if there were a specified set of conditions which, when satisfied, would mark the termination of the Apollo program and the start of the lunar exploration program. He said: "It is recommended that the accomplishment of the first lunar landing and safe return of the crew be defined as the end of the Apollo Program. This will give a crisp ending that everyone can understand and will be the minimum cost program. The Lunar Exploration Program, or whatever name is selected, will have a definable whole and can be planned and defended as a unit. . . . The successful termination of the Apollo Program should not be dependent on the successful deployment of ALSEP, EVA on the lunar surface, photos, soil samples or other experiments. Such objectives should not be mandatory for the first landing mission." Trimble added that he had discussed these points with NASA's Associate Administrator for Manned Space Flight George E. Mueller and it was his understanding that Mueller not only agreed but also planned to include similar material in his congressional testimony in defense of the budget. Phillips made Commander of SAMSO. - . Spacecraft Bus: Apollo Lunar Landing. Spacecraft: Apollo. Lieutenant General Samuel C. Phillips, former director of NASA's Apollo program, became Commander of SAMSO, replacing Lieutenant General John W. O'Neill who moved up to become Vice Commander, AFSC..
1970 January 4 - . Launch Vehicle: Saturn V.
NASA canceled the Apollo 20 mission and stretched out the remaining seven missions - . Nation: USA. Related Persons: Low, George. Program: Apollo. Flight: Apollo 20. Spacecraft: Apollo Lunar Landing. NASA had canceled the Apollo 20 mission and stretched out the remaining seven missions to six-month intervals, Deputy Administrator George M. Low told the press in an interview after dedication of the Lunar Science Institute (next to MSC in Houston). Budget restrictions had brought the decision to suspend Saturn V launch vehicle production after vehicle 515 and to use the Apollo 20 Saturn V to launch the first U.S. space station in 1972. 1970 September 2 - . NASA canceling Apollo missions 15 and 19 because of congressional cuts - . Nation: USA. Related Persons: Paine. Program: Apollo. Flight: Apollo 14. Spacecraft: Apollo Lunar Landing. NASA was canceling Apollo missions 15 and 19 because of congressional cuts in FY 1971 NASA appropriations, Administrator Thomas O. Paine announced in a Washington news conference. Remaining missions would be designated Apollo 14 through 17. The Apollo budget would be reduced by $42.1 million, to $914.4 million - within total NASA $3.27 billion.